As a newborn photographer CT, I firmly believe that babies can sense the loving bond between a family the moment they are born. Instant calm washes over them when they are handed to their mother and snuggle in to her warm body. They feel at ease nestled into their father’s chest. But I also think the loving bond between the parents transfers to their little one, too. It’s amazing that even from day one, newborns have a sense of “home.” They have a vague awareness of who their family is, and that’s where they feel most at peace. This is one of those families that just radiates love. They were one of the sweetest I’ve ever met. He is from Egypt, and she is from the states. Despite the sleepless nights and round-the-clock diaper changes, it’s easy to see that they are so in love with each other. The circle photo of Mom and Dad with their foreheads together, looking blissfully at each other, is easily one of my favorites. It shows their deep connection with each other while highlighting their newborn baby girl as the focal point. In each family image, you can just feel Mom’s warm smile through the photos and see the adoration for his girls on Dad’s face. Dad was so kind, loving, and gentle to the two beauties who have his heart. He was so attentive, and jumped to fix whatever was causing even the slightest utterance of discomfort. Fittingly, we had a Valentine’s Day session for this little love. Baby Ava came to the studio at just seven days old, and she was born with the most kissable cheeks I’ve ever seen. She was absolutely precious and such a joy to photograph. The floral headbands framed her pretty face just right. And I am LOVING the cupcake and candy heart theme. The colors are still fairly neutral, showcasing the baby nestled inside the heart, but the sweet treats add a fun flair. She was such a perfect little model throughout the shoot, snoozing away in a deep sleep. We even got a full family portrait (with their most loyal pup) there at the end, too! 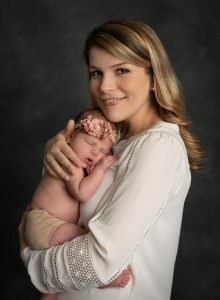 If you are ready to find the best newborn photographer for your family, contact me today.